For a good portion of my life, kayaking was my extreme sport of choice. No, not terribly extreme, but that fact in itself is demonstrative of how little risk has played into my outdoor activities (or activities in general, really). Thrill seeking pretty much came down to hiking in the English countryside without a map and the simple rule of never doubling back. 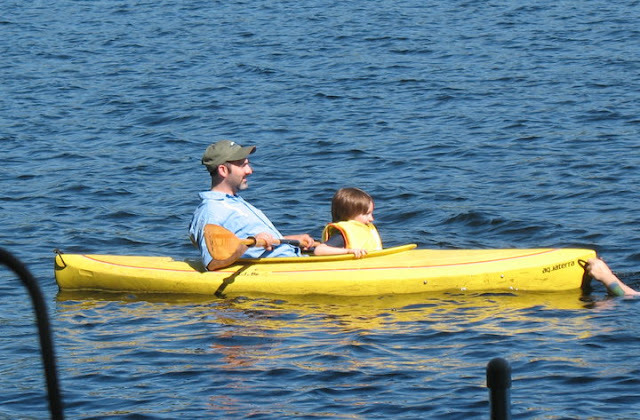 But when faced with the opportunity to get out on a body of water in a boat: whether on lake, river, or sea, I would gravitate toward the kayak. I liked skimming the surface of the water and at times peering straight down to the bottom. I suppose this began at summer camp, then a few Delaware River trips with high school friends. I don’t think I ever went out in Alaska, though always imagined it would be exciting to do so as glaciers calved next to me and orca hovered beneath. Jamie and I tandem kayaked in Monteray Bay, tailed by sea otters (vicious, snarling sea otters!). And then our first house was on a small pond, just right for a relaxing drift. We moved in months before Wyatt was born; and when assigned to sketch an ideal picture of parenthood (the greatest adrenaline rush of all!) for our birthing class, I drew my point of view of sitting in a kayak with my child between my legs, paddling off into a golden sunset. That's a perfect fantasy of parenthood from the perspective of a person who had no idea what he was in for (in complete control of his vessel, on still, unwavering waters, with a passenger who can neither move nor speak unpredictably). I was very fortunate to make that image a reality a year or so later but had not been in a kayak since the stroke. Here's a picture of that last excursion in 2010, with our family friend Cyrus (though I think Wyatt and I went out that day, too). This summer I’m planning to do a few different activities with an organization called Maine Adaptive Sports & Recreation (both cycling and kayaking) and had originally hoped to go out with them Friday, July 7. Unfortunately, I didn’t get on their roster in time. However, in anticipation and in consultation with a friend who works with a similar organization in San Francisco, I purchased a set of kayaking pogies, which are designed to keep your hands warm in cold water sea kayaking but can double as an assistive device. My friend described them as oven mitts that attach to the paddle. And that’s pretty much what they are. Of course, I only need one pogie but figured it would be a relatively easy way to lash my left hand to the paddle. My fingers tend to curl in and could perhaps be pried open to wrap around the paddle shaft, but I don’t have enough conscious grip to hold onto it for long. Living one handed for the past seven years has been a difficult choice for me. In part, it was a matter of sticking to my strengths and not living in false hope of rebuilding my symmetry. But I’ve often wondered if it would be considered an insult to someone whose left arm had been amputated for me to simply ignore my left arm and hand. Yes, I find periodic jobs for it like flipping light switches and holding my toothbrush while applying paste. But for the most part, I do try to forget it’s there and keep it out of my way (unless I consciously hold it up from my shoulder, gravity will pull it down at my side). I could melodramatically argue that while, yes, I do still technically have a left arm and hand, I’ve had a right hemisphere brain amputation and therefore lack the ability to control my left side beyond very basic, selectively-practiced and re-wired movements (i.e. it's more of a software than hardware problem). As I said, the muscles are somewhat contracted and tend toward pulling in toward my body or pulling up from the shoulder. Straightening or swinging out feels unnatural and triggers tremors from feedback in the left side of my brain, which already has its work cut out for it, having to manage every other thought and bodily function it was never intended to. So I do what I can. Judge not. Anyway, Saturday, July 8, was our friends’ Ed and Amy’s annual July Fourth-ish party at their lake house. Seven years ago (when the above picture was taken), I brought that gathering to a screeching halt with the announcement that I was growing a ticking time bomb in my head; and this group has supported me the whole way. So what better place to unveil my grand scheme to put my left arm to work? When, days earlier, I'd revealed my plan to Jamie, she had her doubts and worries. Because, understandably, she’s made it her job to worry about everything she can (or even can’t) control. And I’ve made it my job to understand and test my limits as safely and responsibly as possible and to not worry if I can help it. To paraphrase Taylor Swift, the doubters are gonna doubt and the worriers are gonna worry. And I’m just gonna shake it off (with my one good hand!). So, with Jamie and Ed’s help, I managed to ease myself into a wide-mouthed kayak on land (“ease” being a relative term of a hard sit-down later described as a, “controlled fall”). I'd say that description about covers all bipedal locomotion. Once I was seated comfortably and securely, we attached the paddle to the pogie, secured the pogie to my wrist with a Velcro strap; and gently slid and lowered the kayak into the lake. From there I was pretty much on my own. While I imagined I’d work into some sort of cyclical rhythm with my left arm following the motion of my right, what turned out to be more natural was resting the left paddle shaft on that side of the boat, pull paddling on the right, and then paddling on the left by pushing with my right arm. That got tiring pretty quickly, so I did try using my left arm to pull as well, pretty effectively. For awhile I actually managed not to just go in circles. I made it far enough out to see a bald eagle flying in the distance and to sit and rock in the waves, ride the current into shore, and have Jamie and Wyatt swim along side me (see below). And the doubters stopped doubting, the worriers stopped worrying (about that particular thing for that particular moment), and I basked in the sun and the gentle lap of the water. Giving up use of my left hand does mean letting go of certain things I always took for granted. For instance, peering out at fireflies the other night, I realized I will probably never cup one in my hands again. But figuring out how to do what I want with what I have makes every accomplishment that much more meaningful.It isn’t fun having to repeatedly prove myself. But it's also nice to confirm what I think I’m capable of. How many people does it take to screw me into a kayak in 2017? At least three. Note the silver pogie on my left hand. I was so freaking happy to see you in that kayak, Ken! I think this is a good thing to see more and more happy moment. I love it very much. Paddle is also good for the body health and it is also one type of exercise.